Today we all Indians woke up to the Petrol Shock, highest since 1947 – A steep 10% Hike in petrol price. Most of you must be wondering when the Crude Oil Prices are relatively stable why do we have to pay an extra 10% for Petrol ? The answer is simple, the Bad Governance and Policies of Congress led UPA Government and we do not hesitate to directly hold Dr Manmohan Singh and Finance Minister Mr Pranab Mukherjee for this Shock. 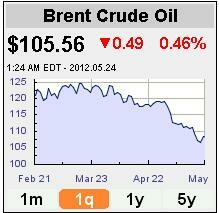 As seen in the Crude Oil Chart, the Brent Prices have declined from $120 levels to $105 levels between Feb-2012 and May-24-2012. However, during the same period, the USD strengthened against Indian Rupee by 14% [Rs 49.12 to Rs 56 – Source RBI] as no Foreign Investors want to commit funds to Indian economy which is Badly managed and is in a deep mess but Mr. Mukherjee and Dr. Singh are in a state of denial. 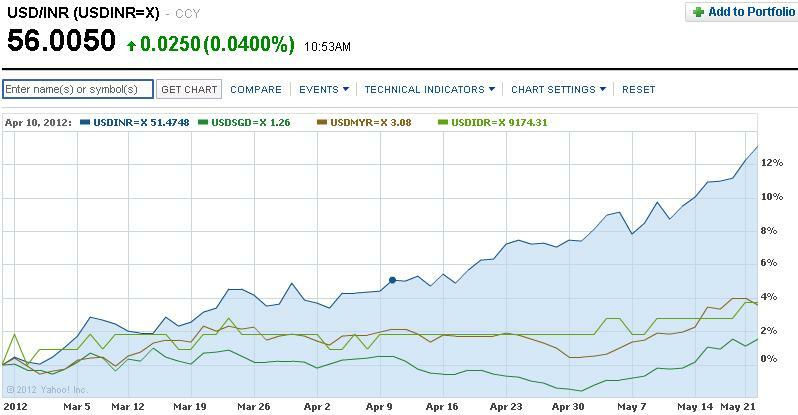 Is the INR Only Currency that is weakening against the Dollar or all Asian currencies are ? If the trend was like during the Asian Economic Crisis, we would just shrug off. However, to satiate our quest a quick comparison of Asian currencies – Singapore Dollar, Malaysian Ringgit, Indonesian Rupiah indicate proves that it is only the INR that is weakening consistently even after RBI has intervened aggressively. The following chart below shows how INR has weakened against USD by 14% while rest of the Asian currencies are relatively stable. HDFC Founder, Deepak Parkeh had warned the Government in advance about the the collapse of the Indian Rupee – but who can bell the arrogant cats FM and PM ? It is our duty to analyze and present unbiased Facts about the Indian Economy and we’ll leave the rest for you readers to decide upon as you are as important to the nation as any other Indian citizen is. Update: Chinese Yuan is excluded in this research because the it is not a Freely Traded Currency and has to trade within a range set by Chinese Government.